Light is ever expanding and unfolding. Right now, the light present on the planet is perfectly aligned for you to lift and enter into a higher level of experiencing divine love . Right now you have to opportunity to leave the lessons of your past goodbye and step into a new paradigm. Enter into a new level of love and light in your life. You have so much support beyond the realms of the physical available to you. I am happy to share with you a new and completely free to you angel message channeled with Archangel Uriel this message this morning during the peak energies of the New Moon. Right Click the link below to download this message to your computer (Ctrl Click Mac), or keep reading to enjoy the transcribed version of this .MP3 message below. 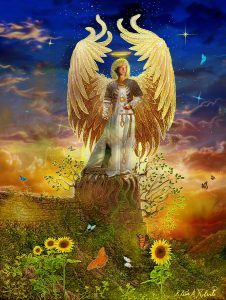 “Greetings beloved one, indeed I am Archangel Uriel and I greet you in this moment. I'm so pleased to connect with you now for dearest one you truly are once again at a powerful point of new beginning. However in this new beginning with your conscious awareness and with your intention you are able to enter into a new level, a new higher level of experience like you are spiraling upward and have suddenly reached a new platform by which you are able to imprint your consciousness on the world around you. You are here to co-create indeed but also to simply experience your life with new eyes, and that a new level. Experiencing a new level of hope, of frequency and of course of love. And so at this time as we angels who are present with you, as many light beings and Ascended Masters now greet you on the inner planes, remember that you can always enter into this place by quieting your mind, by opening your heart, and by entering in. Go inward, center open your heart, and from this inner plane, lift. For light peace, hope, compassion, and frequency flow your way. And on this inner realm you are able to naturally, in whatever way feels right for you, open to receive it. Think, I'm open to receive the divine love and light that is broadcast and sent my way now. And as you intend to this, it is so for we are already sending, and now with your permission, you begin to left let yourself lift. Give yourself permission to be okay with whatever you are experiencing at this time. Feel yourself letting go of judgment and letting go of the part of your mind that needs to analyze the experience. The part of you that needs to wonder about whether this is true and valid or perhaps is saying to you “this is not really are making it all up”, let this part of you, your mind, your ego, turn away. Let it focus on a blank screen before you and let your conscious awareness enter deeper in, inside into the inner realms, the space between. Between the words I speak you see, between every word is a gap, and opening an entrance by which you can dive into, into each silent moment between the words I speak is complete silence bliss calm, light. Breathe in now and imagine that you are breathing in all of this love of this uplifted frequency and of compassion, as you breathe in integrate this light, let it flow throughout your Bering. And now as you breathe out imagine you are sending love and light out to the world, to a specific person that you may focus your awareness on now. Someone who you know who needs a little love a little hope or light now. Or you may simply focus on the planet, and so breathe in, fully entering into the silent still calm, the power point by which you are able to connect with divine love. And now when you breathe out, send light from the divine, from the realms above available in unlimited supply, to earth, to a friend, to the collective humanity, or to one individual who comes into her awareness now. Breathe in as we angels connect you with the infinite source of power, of light, of joy. Let this flow through you, let this flow to anywhere where you have stuck energy to anywhere where you are experiencing pain or density. Imagine that the light you are breathing you are breathing into those areas and with your conscious awareness you indeed can focus the light we angels send your way in this manner. You can focus upon an area where you feel tension and as you breathe in and focus therein, the energy, the light, the frequency will flow that way. Will flow where ever you need it most, let this occur. You relax, breathe, and let your true authentic light come in. For you are one with this frequency we broadcast. You are one with the voice that speaks these words you are one with I Archangel Uriel, with all that is. Feel this for a moment, your oneness with the energy you sit or lay upon. Your oneness with the walls or trees that surround you. Your oneness with all you are not separate, you are one with it, you are part of it you are an essential component. Like is seen in a machine, where there are no extra parts. Every part is necessary, is needed it makes the one unit, the one machine cohesively perform as a whole, as one. So too is the Earth, Planet Earth, Spaceship Earth- flying through the cosmos, one machine, one organic creation, one unit. Yes there are unique people, personalities inventions, creations, thoughts and emotions, tangible items, intangible elements, physical elements, there are an unlimited variety of things and beings and places however when you zoom in, when you zoom in physically with the microscope or when you zoom in consciously with your awareness you are able to see that at the atomic level it is mostly space anyway. And ultimately each and everything is connected by this empty space. And so when you connect with the peace within, the stillness within that comes through quieting your mind and entering into the space between words, the space inside your open heart. You connect with that which connects everything in a way you are connected now to every thing, to every one, to the one energy that you are that you are a part of. The energy of one that is not outside of you, that is you. Compassion is this space between, compassion is this silence, is this web of life that connects all. And with awareness now knowing that you are connected you can choose to plant a positive intention, to send a positive wave, to create a beneficial ripple throughout the flow of existence, throughout all that is, throughout compassion, throughout creation, throughout planet Earth and beyond. Throughout the entire mufti-verse, throughout all realms that be even those beyond the grasp of what your mind can currently accept handle and integrate into being. You are one with this all and so once again breathe in, letting the love and blessings that we beings of light broadcast your way flow to wherever you most need it. And as you exhale let your self dear being of light, as you are authentically this at soul level, let yourself flow this light out to those who need it and to those who come into your awareness now. Continue to breathe, breathing in the light and sending it out. So that your every in breath the light is able to flow more freely throughout your body. And in this way as you flow more light you are able to understand more fully your truth. To understand more fully who you are as a soul, as a spiritual being. As an angelic being in spirit, for know that indeed your soul resides in a realm likened to that of the angelic realm. You are a conscious being, you are a light being, and so as you breathe in the light let this simple truth make more sense. Let yourself feel the truth of who you are. Let yourself know… You may begin to imagine or see this light, and now as you breathe out share your light, your blessings, your compassion with all that is. Let these droplets of light you now flow out ripple across the web of life. The grid connecting all on planet Earth. Whatever visual works for you is fine such as a grid, or spiderweb around the entire planet that suddenly millions of light droplets like light shining through water, stream all along this web, all along this grid around the earth so that the water droplets, the crystalline particles of light that are broadcast from we and broadcast from you, flow around the entire planet. Glide effortlessly throughout all existence, helping you and helping all with this new beginning to reach a new level. To let go of the patterns of past, to let go of your past ways of relating and responding to the world around you that do not serve. Yes now you are able to reach a new level, and with your awareness, you can use this new level you are at, this new level of light this, new level of connection of groundedness, of hope, to bring this light frequency. Bringing awakening to those lives of people who have touched you, the lives of people you hold dear.For those you are connected with in the physical consciously that you are aware of, your connection is increased. Without even thinking of these people, as your light quotient increases, as you reach this new level, they are automatically impacted in a positive way. Your every thought, your every emotion, your every intention and even your worries create the energy signature that you broadcast. The energy signature that flows out from you in the present moment in every moment and connects with the whole of collective consciousness. You affect what is, let yourself intend from this new level of holding more light than you ever have, to begin to send, contribute more love, more joy, more compassion than you ever have. And to turn away from thinking, from dwelling upon lower vibrations and things that do not ultimately serve. Things that serve your ego mind and the part of you that wants to fear, that wants to remain small. But this is not who you are authentically. You are meant to shine bright. You are meant to uniquely live your truth. As you reach your next level of becoming now, as you let light enter in, as you let that which no longer serves fall away and you choose to make it a priority to respond with love. Not only is it something you are working with, an idea you heard, it is a priority to practice non judgment, to practice awareness, being aware that the person that just annoyed you is you, is a mirror, is the reflection, and is ultimately one energy focused in consciousness focused in physical reality for the purpose of your soul development and growth. The anchoring of your full authentic self and spiritual light into the physical. You affect all. This can be true the other way around. As you do reach a new level, as you open to the light, you may find that you are more sensitive than you were before. Perhaps even to subtle vibrations beyond the physical. This is why it is ever important to connect with the light within and to connect with your guides by consciously intending this to be and calling or inviting us in. This way you remain protected. However if you do go out into a situation, especially at events like parties or gatherings where the individuals there want to get to know each other, want to interact in the physical. In these situations your energy automatically begins to arc in, begins to mix with the energy of those around you. When you are in thought, especially when you are in a place of worry or when your thoughts are spiraling quickly, your consciousness connects not only with your thoughts, but your thoughts create a bubble around you that connects with the thought bubble of those thinking around you. This is why in crowded situations or places you can sometimes feel overwhelmed. It may not even be your own thoughts you are picking up on, but your thoughts connect with the thoughts of others, connect with the thoughts of others, and suddenly you may find you are drowning in thought. This simple solution here is to practice clearing your mind. For when you are in a place of still, silent, calm, clear. A simple meditation that you can do in an instant, and a moment is clear your mind. As you do this it is a twofold process it is quieting your mind and just opening your heart. Feeling your energy pull inward to connect. There, that still, that silence that is your power point and from that point, think or say “angels take any thoughts that are not mind any thought swarms or thoughts conglomerations, lift them up into the light, help clarity and mindfulness enter into this moment.” Know that you can only claim this for yourself- this clarity this focus on the present, cleared headedness. If you are in this place of clarity, and others remain in a place of spiraling thoughts, you will not be affected in the same way. If you do find that you are once again getting caught up in the spiral of thought, reset. Enter in, quiet your mind like snapping and when you snap, it all stops. Still, silent, clear. If needed ask your angels and guide's to take away any thoughts that are not my own, take away any negativity that I have absorbed consciously or unconsciously from others, release it into the light and help me to state ever present ever clear and aware in my present moment. Help me respond with love in every situation in every blessing, in every challenge, in every struggle… love. For know that this choice will serve you greatly, and of course it serves all that is, for you are connected to all. You are at a point where you can use this new level of light you have accumulated to step forward. If you feel ready now, imagine that a door of light appears before you. This door is the entrance into the next level. The entrance into a higher level of expressing and being and living as the true expression of your authentic self. This door need not be opened, for you are ready, and the door swings open wide. Feel the surge of light as the light from your higher level of being flows into this now. With your consciousness now, step forward, step through the light,t step through the doorway and you're greeted, still on the inner realms by your team (unique to you) your guides and angels of the light, the highest best most loving guide who can serve you in reaching this new level and in integrating the new lessons and opportunities found at this new level of existence. Now that you are here, know that all of you, indeed has been an initiated has been lifted into a higher level of expression. This includes your ego mind, and so since you are at this new level you may have to start over in a sense, of learning how to turn away from the thoughts of doubt, from the thoughts of ego, of judgment, of pride. Letting these turn away, letting yourself focus on the blank screen before you, setting with consciousness your ego mind on the shelf, where you can return to analyze to wonder, to question later. But for now, in this now moment and in any moment when you are trying or wanting to connect with the light and connect with your true authentic spirit and self, to move forward on your path of full awakening. Set your mind aside on the shelf, and enter into your heart, for it is not with conscious thought that you are able to enter into the realm of spirit, it is with your love and it is with your compassion.These are the forces of nature and the forces of the universe that connect you with all beings. These are powerful lights, present on earth that when effectively integrated into your being and into her experience, will change the paradigm of all that is. So that soon not only you are at a new level, but all of humanity have integrated more light as a collective, beginning to work together in this new paradigm for planet Earth. Centered in love and compassion and hope, aware of the oneness, working as one, with all beings, with each other, with the guides and angels beyond the physical, and with pure light. This new level begins now and it begins with you. Use this new light wisely by intending how you would like to see it create, and by remembering when you feel overwhelmed by thought, most of it may not even be yours. And so clear your mind, ask that the spheres of thought influence be released, and return to still silence blissful connection from your heart within with love…. And with all that is. Enjoy your new level of being able to honor, not judge where you have been up until now, and able to consciously be aware of where you are headed. For the journey ends not here, it continues forward, spiraling upward. There is always more light, there is always a further, there is always a next level and although you have advanced now, there's still someone who is further and so let this inspire you to keep going in the now moment. Breathe, let the light in, let your soul light in, let yourself shine let yourself fly, let yourself be in joy and love and this ushers you forward into integrating the light into creating the blessings you seek manifesting the dreams and the desires that you have that are the guidance of your soul and of your soul light. Shine, live your truth and live from this next highest level of Bering. Keep going. In every now moment choose love and choose compassion and remember that you are not separate, you are one with all. Love this special guided message that I thank you for with love and light.